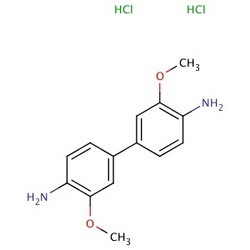 o-Dianisidine (3, 3′-dimethoxybenzidine) is a peroxidase substrate suitable for use in ELISA procedures. This substrate produces a soluble end product that is yellow-orange in color and can be read spectrophotometrically at 405 nm. The reaction may be stopped with 5 M HCl. o-Dianisidine (3,3′-dimethoxybenzidine) is a peroxidase substrate suitable for use in ELISA procedures. This substrate produces a soluble end product that is yellow-orange in color and can be read spectrophotometrically at 405 nm. The reaction may be stopped with 5 M HCl.